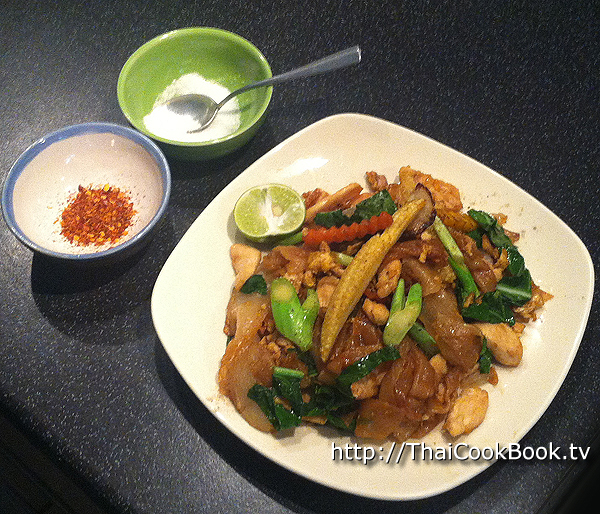 Pad See Ew is a popular Thai one-dish meal, made with soft and chewy rice noodles that are pan fried with Chinese broccoli and either sliced pork or chicken. 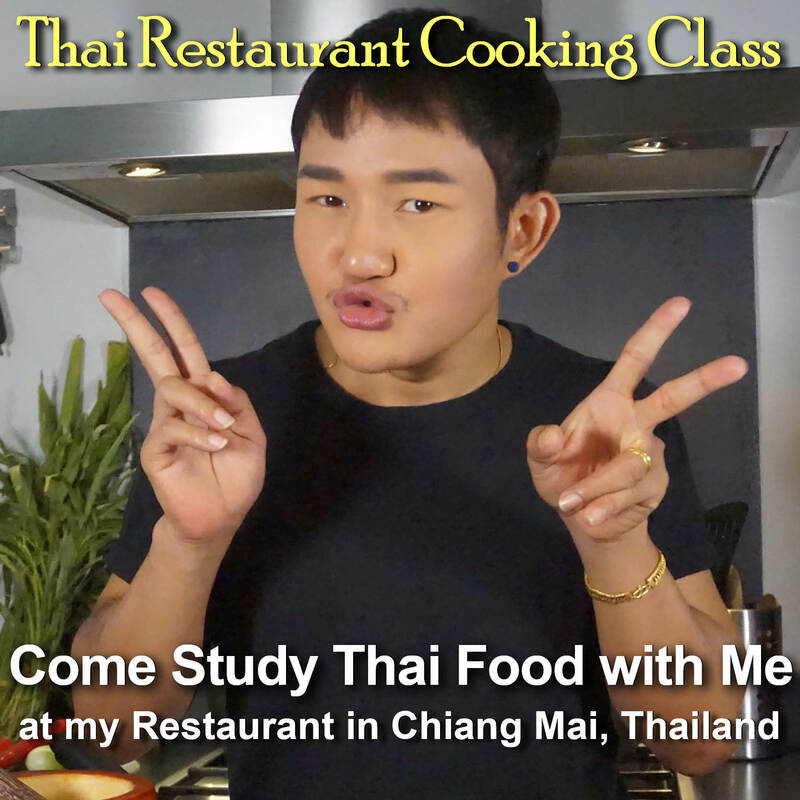 It is not spicy, so you can serve it to your friends that can't handle all the chilies that are in a lot of other Thai stir-fried dishes. Some people like to spice it up at the table with chili sauce or ground red chilies, so it's certain to be enjoyed by everyone. 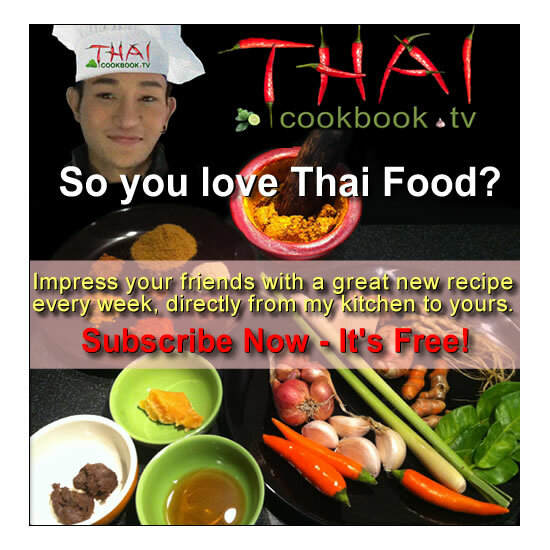 We just love the way the rice noodles stick together and make a delicious, hearty meal. This recipe is for one usual serving, but it is filling so can be shared if you are serving it with other foods. 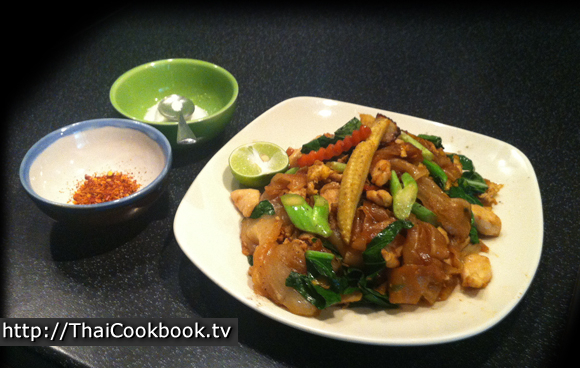 What's in our Pan Fried Rice Noodles with Chinese Broccoli. 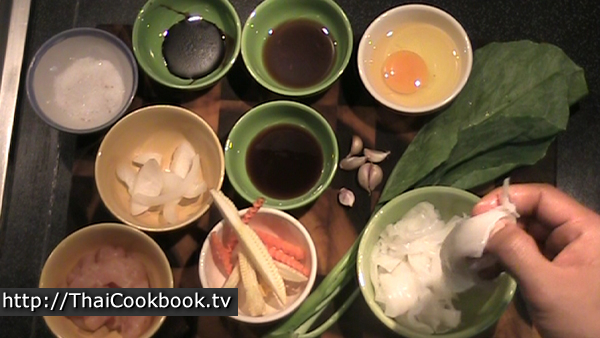 How we make our Pan Fried Rice Noodles with Chinese Broccoli. 1) Fry garlic and onion in oil for about 30 seconds, then add the chicken meat. Fry until it is almost cooked. 2) Add baby corn, carrot, and chilies, and continue frying. Crack the egg in and stir it up well. 3) Add light soy sauce, oyster sauce, and sugar. Stir well and cook until it starts to get a little brown. Assemble all the ingredients. Cut the chicken breast meat into thin slices. 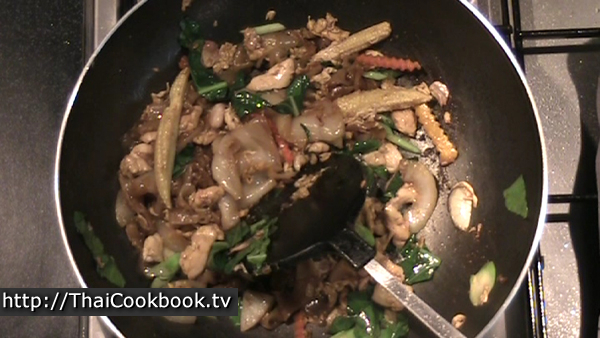 Cut 1/2 slice of onion, cut the Chinese broccoli and vegetables. If you are using dry rice noodles instead of fresh, prepare them in advance according the the directions on the package. 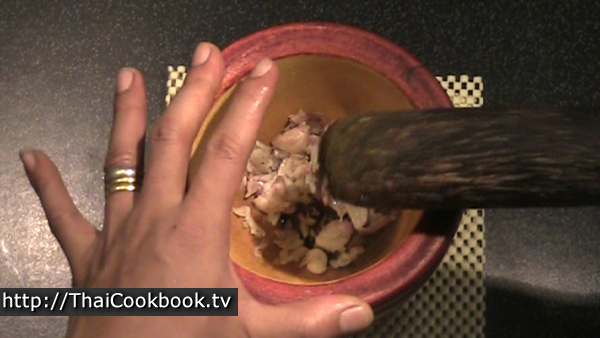 Pound the whole garlic cloves using a mortar and pestle (garlic press or chopping is also fine). 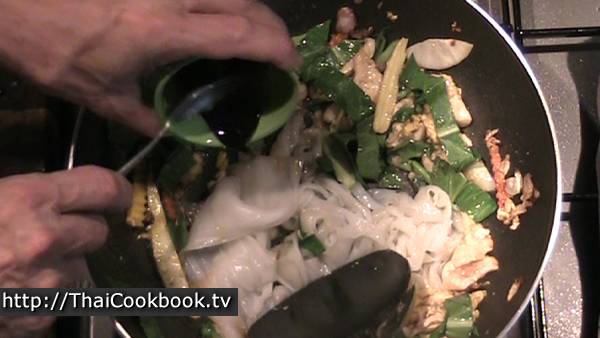 Heat 2 tablespoon vegetable oil in a large frying pan or wok. Add the crush garlic and the few pieces of onion. Let it cook for just a bit, then add the chicken meat. Fry that for about a minute, or until it starts to get most of the way cooked. Add the baby corn, carrot, and chilies. 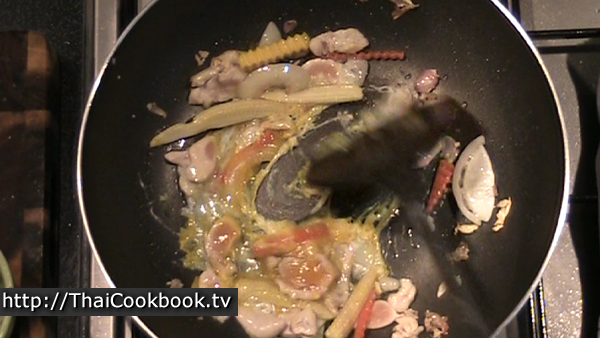 Cook for a few seconds, then add the egg and stir well until it is mostly cooked. Add the light soy sauce, oyster sauce, and sugar. Stir well and cook until it starts to get a little brown. Add the broccoli and stir up, then add the noodles. Next add the dark sweet soy sauce. Stir it well and push the noodles down into the pan, spreading and separating the individual noodles and much as possible. Keep pushing and turning them so they soak up all the brown sauces and oil, and start to fry in the pan and turn a little brown and sticky. When the broccoli is a little soft, it's done. Be careful not to overcook it. The vegetables should stay a little crispy. Serve on a medium-sized plate with some lime, to be squeezed over the food. Also serve with ground red chilli or chili sauce if you like it spicy. Sugar can be added to make it sweeter. This is according to taste, and can be left off as it is already going to be delicious without adding a thing. Enjoy!